Eating a variety of healthy foods is important for your child health. But, it's not always easy to get kids to try new and different foods―and sometimes, it can be downright frustrating. The good news is there's a lot you can do to help your child get comfortable exploring a variety of foods. And you both may end up having some fun while you're at it! 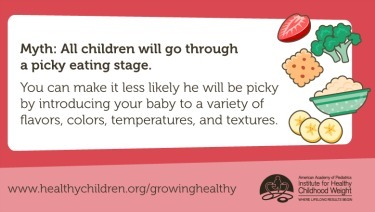 Take steps to prevent picky eating. Use these strategies if your child is a picky eater. Stay strong―don't give in to tantrums or whining. Still have questions? Your child's doctor is your partner in raising a healthy child. Ask the Pediatrician: Should I sneak fruits and veggies into my preschooler's food?